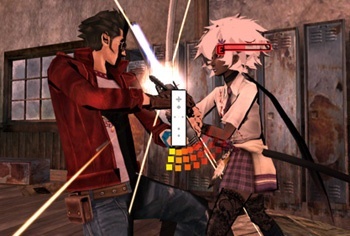 The man behind No More Heroes and Killer 7 is interested in developing for Nintendo's 3D-capable handheld. Suda51 has always marched to the beat of a different drummer, which is a euphemistic way of saying that the dude is weird as hell. That's not a bad thing, though: His games are great, they're just ... unusual. Very, very unusual. Speaking with Official Nintendo Magazine UK, Suda51 said that he'd love to make a game for Nintendo's upcoming glasses-free 3D handheld. "I do have many ideas," said the designer. I would love to try to develop a game for 3DS if I have a chance." And what, exactly, would he like to make? "I hope for the realization of a training remote like Luke Skywalker used for force training in Star Wars Episode IV: A New Hope." Okay, I'm going to have stop for a moment. How exactly would that work? Would the stylus be the lightsaber, and you'd have to ... block the bolts? Would you use the rumored accelerometer and camera to tilt and move the 3DS so that it faces the "remote"? On second thought, that actually sounds kinda cool. Suda51 is currently working on a teamup with Resident Evil creator Shinji Mikami, but we hope get starts work on his 3DS project as soon as he's done.